Grainstone in the Dunham Classification (Brassfield Formation near Fairborn, Ohio). 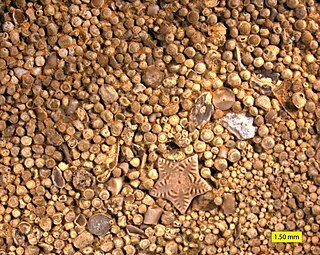 Grains are crinoid fragments. Under the Dunham classification (Dunham, 1962)  system of limestones, a grainstone is defined as a grain-supported carbonate rock that contains less than 1% mud-grade material. This definition has recently been clarified as a carbonate-dominated rock that does not contain any carbonate mud and where less than 10% of the components are larger than 2 mm. The spaces between grains may be empty (pores) or filled by cement. The presence of any primary carbonate mud precludes a classification of grainstone. A study of the use of carbonate classification systems by Lokier and Al Junaibi (2016)  highlighted that the most common source of confusion in the classification of grainstone was to misidentify fine-grained internal micrite, generated by in-situ processes, as clay–silt grade sediment - thus resulting in the misidentification of grainstone as packstone. Failure to correctly determine the size and abundance of component grains >2 mm was also a source of error. Dunham's original definition of grainstone stated that it must contain less than 1% mud to fine-silt grade (<20 μm) sediment. Embry & Klovan (1971)  and Wright (1992)  reduced the permitted amount of carbonate mud in a grainstone to zero. Given that grainstone facies are interpreted to have been deposited under high-energy conditions, it is sensible to preclude the presence of primary carbonate mud from this classification. The lithology of a rock unit is a description of its physical characteristics visible at outcrop, in hand or core samples, or with low magnification microscopy. Physical characteristics include colour, texture, grain size, and composition. Lithology may refer to either a detailed description of these characteristics, or a summary of the gross physical character of a rock. Lithology is the basis of subdividing rock sequences into individual lithostratigraphic units for the purposes of mapping and correlation between areas. In certain applications, such as site investigations, lithology is described using a standard terminology such as in the European geotechnical standard Eurocode 7. Under the Dunham classification system of limestones, a wackestone is defined as a mud-supported carbonate rock that contains greater than 10% grains. Most recently, this definition has been clarified as a carbonate-dominated rock in which the carbonate mud component supports a fabric comprising 10% or more very fine-sand grade or larger grains but where less than 10% of the rock is formed of grains larger than sand grade . Iron-rich sedimentary rocks are sedimentary rocks which contain 15% or more iron. However, most sedimentary rocks contain iron in varying degrees. The majority of these rocks were deposited during specific geologic time periods: The Precambrian, the early Paleozoic, and the middle to late Mesozoic. Overall, they make up a very small portion of the total sedimentary record. A framestone is a special type of carbonate rock in the Dunham classification. ↑ Dunham, R.J. (1962) Classification of carbonate rocks according to depositional texture. In: Classification of Carbonate Rocks (Ed. W.E. Ham), Am. Assoc. Pet. Geol. Mem., 1, 108–121. ↑ Lokier, Stephen W.; Al Junaibi, Mariam (2016-12-01). "The petrographic description of carbonate facies: are we all speaking the same language?". Sedimentology. 63 (7): 1843–1885. doi:10.1111/sed.12293. ISSN 1365-3091. ↑ Embry, A.F. and Klovan, J.E. (1971) A Late Devonian reef tract on Northeastern Banks Island, NWT. Bull. Can. Pet. Geol., 19, 730–781. ↑ Wright, V.P. (1992) A revised classification of limestones. Sed. Geol., 76, 177–185.